Able Image Browser is a full featured image viewing solution which is fast, simple-to-use and inexpensive. 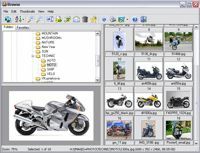 Supports all common image formats: JPEG (JPG and JPE), GIF, Bitmaps (BMP, RLE and DIB), TIFF (TIF and FAX), Metafiles (WMF and EMF), Icons (ICO), PNG, PCX, TGA (TARGA, VDA, ICB, VST, PIX), PBM, PGM and PPM. Image manipulation functions including rotate, flip, crop, resize and various filters and effects.